This was a true one-of-a-kind experience since we lived in a very simple hotel outside of the tourist centre. We would get off the city bus at "La Ceguera" as our hotel was located directly beside the Instituto Cubano de Oftalmología Ramón Pando Ferrer - one of the finest ophthalmological hospitals in the Caribbean. Also around our area was the hot tourist attraction called Tropicana - an open-air nightclub and restaurant surrounded by lush tropical gardens. During the day we enjoyed some relaxed meals at Rodney's Café, and at night, there is a live song-and-dance performance which perfectly embodies the glamour of 1950s Cuba. Tickets to the show are quite pricy at around $70-$80, especially given that meals rarely surpass $10 in Cuba. Our favourite local spots for food were Waka Waka for sit-in deliciousness or hearty take-out, Glamour Café for huge portions of pasta and fish, La Familia for $1 pork and rice bowls, and El Faro for a 24-hour diner. Around La Rampa at the corner of Calle J and 23, there was a lovely little outdoor restaurant called La Favorita. I had my first meal of pulled pork and beans there, which I rapidly inhaled. 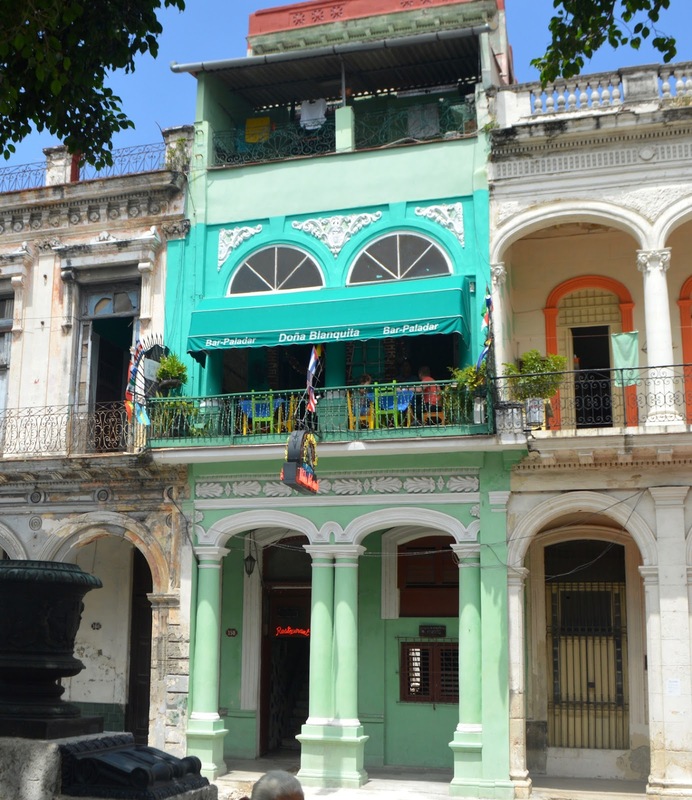 The first thing to understand before walking around Havana is the double currency. 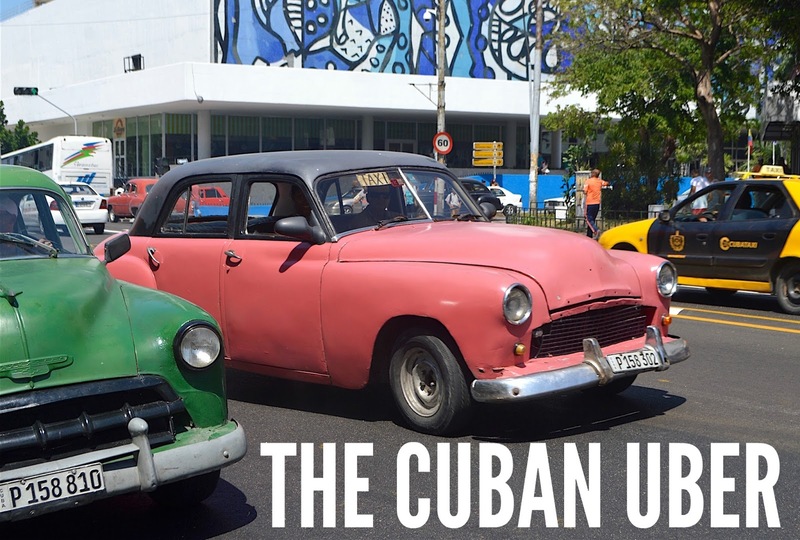 They have Cuban Convertible Pesos (CUC) used by tourists, and regular Cuban Pesos (CUP) used by locals. We changed our Canadian dollars into CUCs at a Cadeca exchange bureau on La Rampa across from La Favorita, and we collected Cuban Pesos as change at local stores or restaurants. It is nearly impossible to exchange money into local CUPs as a non-Cuban. 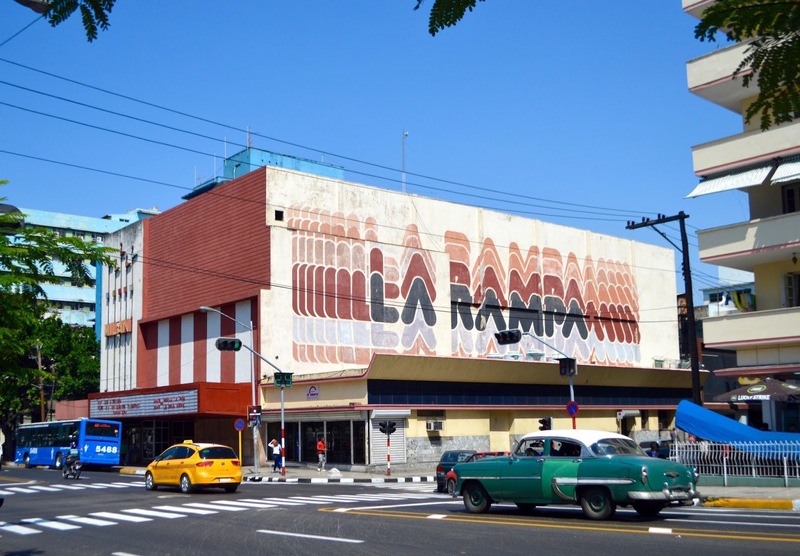 For internet access, you can purchase WiFi cards from street side vendors for around $5, which can mostly be used on La Rampa, like in the lobby of the Habana Libre hotel. 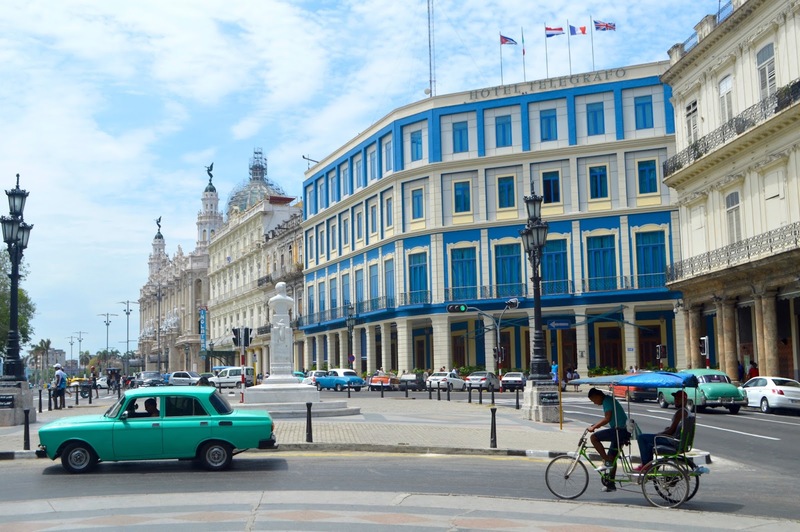 When visiting other parts of Havana, we often took an Almendrón (the Cuban Uber Pool!) for $1-2 per person, or the local bus that cost about 5 cents per ride. Note that these buses do not cater to tourists, and they're often packed to the brim with Cubans on a mission. For $5, the most tourist-friendly transportation option is the hop-on, hop-off bus, that will take you all around the city - even to the beach. 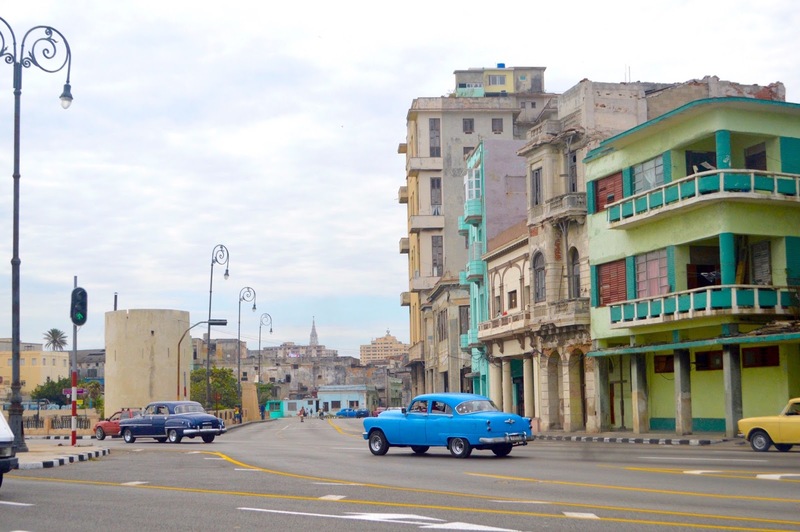 In Havana (or Habana, as the locals call it) you'll immediately notice the antique '50s era cars. Many are marked with DIY "Taxi" signs, which indicate that it is an Almendrón (collective taxi). These were our favourite method of transportation to get into the downtown areas. Though convenient and affordable, the reality of riding in vintage cars isn't as picture-perfect as you might expect. The engines expel some pretty noxious clouds of black diesel smoke, which left behind extra freckles on my face at the end of a hot afternoon. 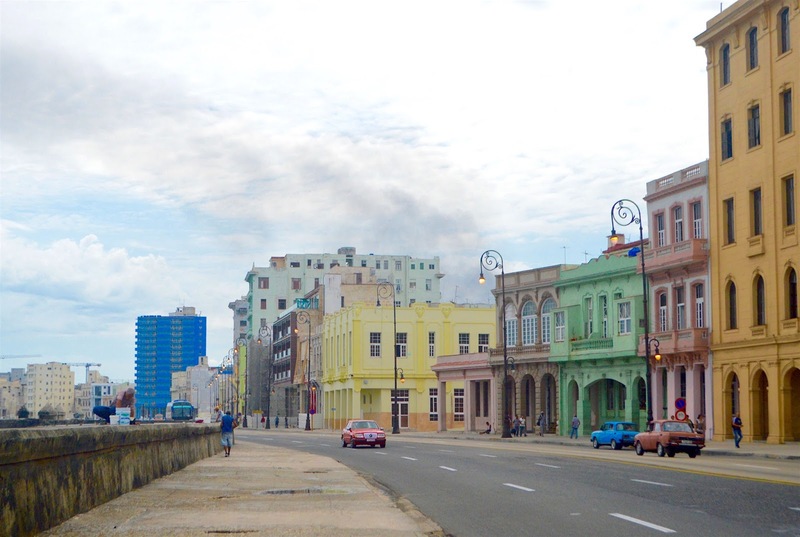 As our professor Ian Martin pointed out, Cuba is described as a country of opposites. With their vintage carros and casas frozen in 1959, next to dedicated medical and educational systems, we can take a trip down memory lane to see how this eclectic country developed into what it is today. In 1492 Christopher Columbus landed in Cuba, which lead to its colonization by Spain. For centuries Cuba was a global sugar sugarcane producer, resulting in wealthy plantation owners, and ever unjust slave labour. In 1895 the Cuban War of Independence broke out, with the goal of becoming liberated from Spanish rule. This war was led by Cuban nationalist José Martí. In 1898 the US intervened by also declaring war on Spain, and they were victorious. Interesting fact: there exists a bust of José Martí at every educational institution to remind students that they must study hard to overcome their daily struggles and national feats. 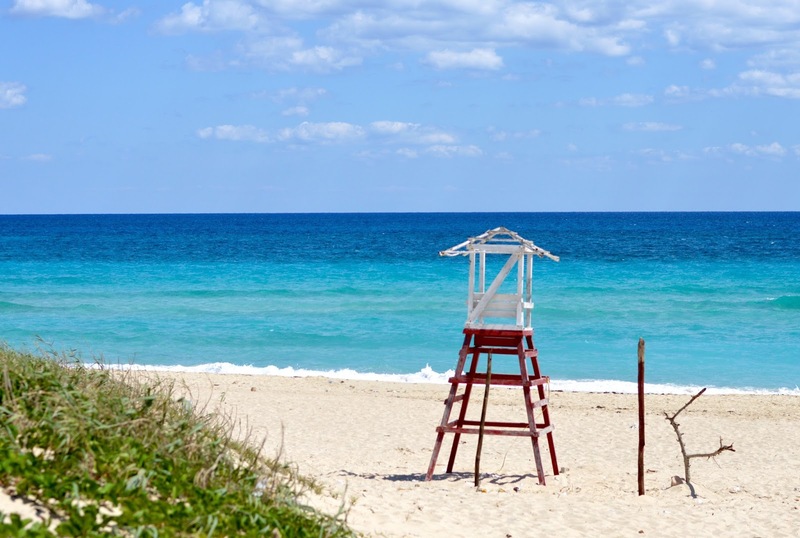 In 1902, Cuba gained independence and began to strengthen ties with the US. Along with the stable economy came the invasion of American politicians, entertainers, socialites, and businessmen who encouraged the growth of casinos, nightclubs, and other fantasies that you can observe in The Godfather Part II. On July 26, 1959, then-Prime Minister Fidel Castro ignited the "July Movement" working to overthrow President Fulgencio Batista and his authoritarian government, which was linked to the US. With much success, the US imposed their economic embargo in 1960. In 1961, the US tried to oust Castro, with their failed invasion at "The Bay of Pigs". It was then that Castro strengthened ties with the Soviet Union. In 1976, Fidel Castro was named President, and life for Cubans became increasingly more difficult. Over the next few years, thousands of middle and upper class Cuban refugees fled to Florida as part of the Mariel Boatlift. The Soviets had been spending something like one million dollars daily to help sustain Cuba, so in 1991 when The Soviet Union disintegrated, Cuba's government lost all of their financial support. In 1993 the US dollar was legalized in Cuba, and for the first time since the revolution, small-scale business were allowed to form. The past two decades have been filled with immense hardships for people in Cuba, as many attempted to jump ship and forget their homeland in hopes of finding a prosperous future elsewhere. Change is happening, albeit rather slowly. 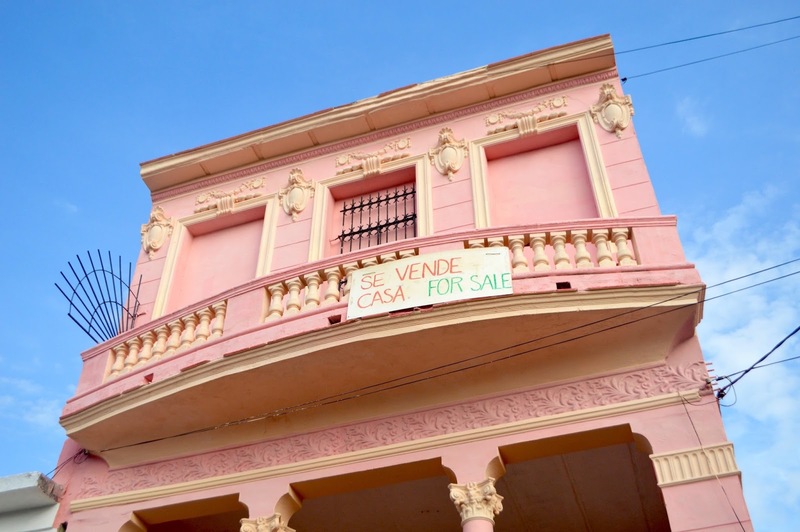 There is a sure sense of caution surrounding most public actions, since only a few years ago people in Cuba couldn't talk to tourists, couldn't make their own money, and couldn't buy things for themselves. The government has been in firm control of the media and the internet, which only became available to the general population in 2015. The average Cuban salary is $25 USD per month, and they receive free education, medical services, and free or subsidized shelter. The rest of their personal needs are barely met, and Cubans are not free to visit other countries without a visa. These firm regulations have resulted in little to no violence, drugs, or racial conflict, and no advertising or commercialization. Talk about anti-America. Cuba has an impeccable art scene, which I was thrilled to observe on my trip. 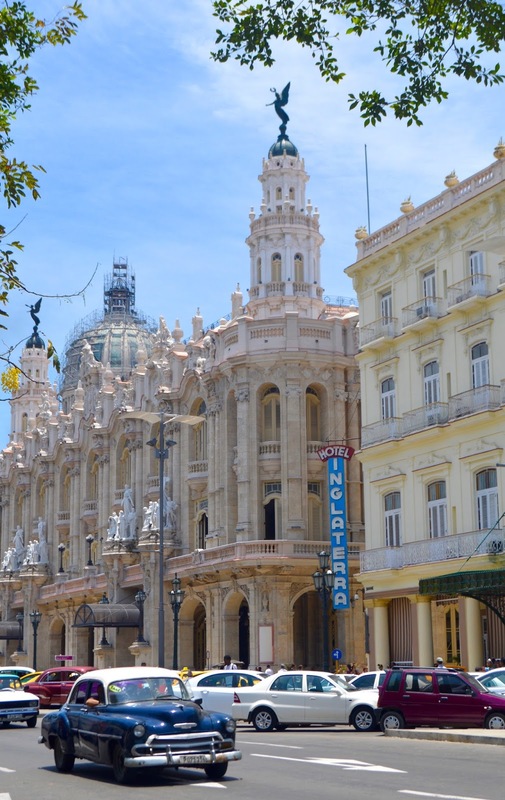 They have stunning museums and galleries, along with the Fábrica de Arte Cubano, better known as FAC. This old oil factory has been transformed into an art gallery and nightclub, where both locals and tourists enjoy music and dancing for a mere 2 CUCs at the door. We saw an awesome performance by Maite Hontele, a Dutch trumpeter living in Cuba who is well known for her Spanish salsa music. 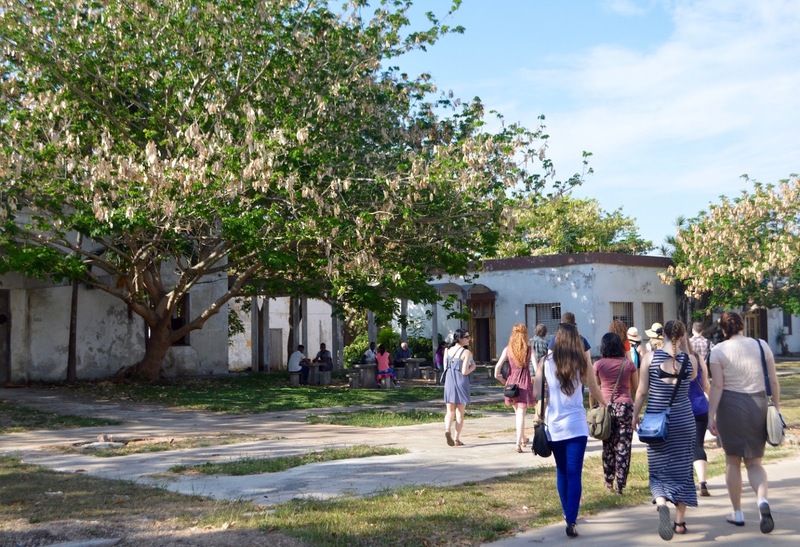 I only realized a few days later that Chanel had staged their Cruise 2016/17 Collection on the Paseo Del Prado, right in the city centre of Havana. Guests at the show sat on park benches scattered around the tree-lined walkway, where models strolled naturally in sandals, brogues, and slides. The fabrics had printed images of Almendróns, and the colour palette was unlike any Chanel collection I've seen before. With jackets slung over their shoulders as the crowd enjoyed live music, the models looked comfortable in their (naturally) glowy makeup and chic fedora hats. This collection absolutely embodied Cuba's relaxed, melodic vibe and provided approachable styles for all ages. 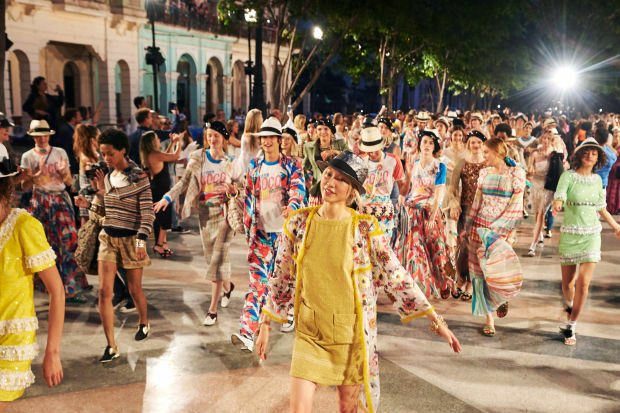 To see more details and to watch the entire #CHANELCRUISECUBA show, click here. Do not drink the water. Remember that if something is washed with tap water, it could still upset your stomach. I'd strongly suggest bringing Imodium and fibre rich granola bars. 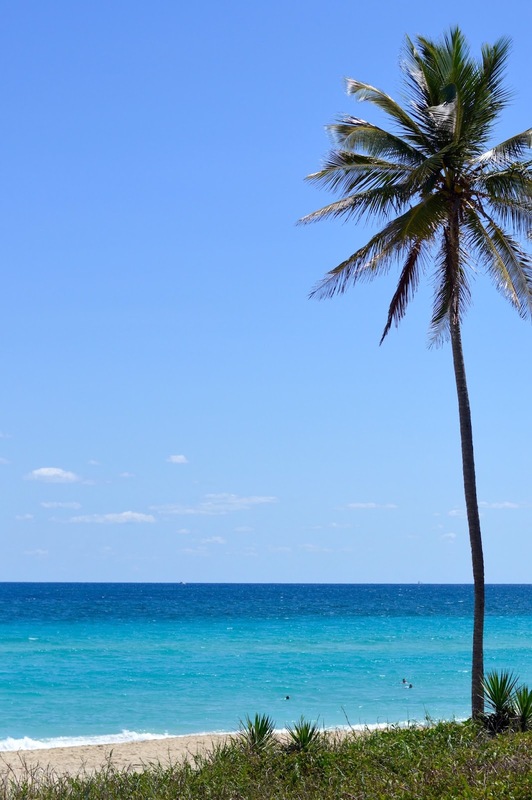 With rice and bread being main components of the Cuban diet, you might experience extremes. The chicken really didn't agree with me, for example. Yellow taxis will rip you off as a tourist, so if you speak Spanish, try taking Almendróns. With the introduction of taxes and new small business laws, people have opened up restaurants and cafes that are usually attached to the front of their house. These are called Paladares, and you can get some very good food at them. There is dual currency - 24 CUP = 1 CUC. You might get change in CUP if you go to a local restaurant. Remember that CUPs have faces on them, CUCs have monuments. You will likely get overcharged if you pay for Almendróns with CUCs - it shows that you aren't a local! Learn some Spanish. Cuban Spanish is SO fast, but you rarely find locals that speak English outside of the big tourist squares. Wear a hat (I got pooped on by birds twice). Bring good sunscreen. You will get burned on the beach. Cuban coffee is good, but quite strong. So are their drinks! Realize that locals will want to talk to you, and they may also request for you to buy them things if you become quick friends. You may see people dressed all in white. One of Cuba's main religions is called Santería, and an Iyabó is someone who wears only white clothing for one year after their initiation into the faith. Local food to try: cassava or yuca con mojo, malanga fritters, cerdo asado (roast pork), bistec uruguayo- two thin pieces of pork stuffed with ham and cheese, then breaded and fried. omg. Tissues. Toilet paper. Wipes. Etc. Clothes - keep the climate in mind! A standout moment for me was when we played "Spot it" with some of our Cuban friends on the beach one afternoon. This is my favourite game to play with a group since it's just as enjoyable for children as it is for adults, and we set the rules so that we could call out the symbols in either English or Spanish. When we were finished playing, our friend Hansel (I met a Gretel too) mentioned how much he enjoyed the game. I couldn't bare putting it back into my bag at that point, so I gave it to him. The smile and hug that followed was so incredible, I wanted to give everyone something special. Cuban people are beautifully unique. Everyone I met projected a sure sense of national pride, and a committed stance to making Cuba better and stronger. Cubans are also smart - 99.8% of their population over the age of 15, both male and female, can read and write. When we were visiting, our classmates really wanted us to learn about their vibrant culture. They shared their lifestyle with us, and ensured that we enjoyed their country to the fullest. Here in Canada, we can get whatever the heck we want, whenever we want. People in Cuba can barely get what they need the most. I left Cuba with newfound appreciation for what we have, perspective on life under communist control, many tidbits of history, and lots of hope for the future.